Are you thinking about adding a three season room or screen porch to your home? There is a myriad of design options, choices, and considerations. One of the things we enjoy most is walking through these decisions with our clients and helping you decide the options that best suits your individual tastes and function of your porch space. 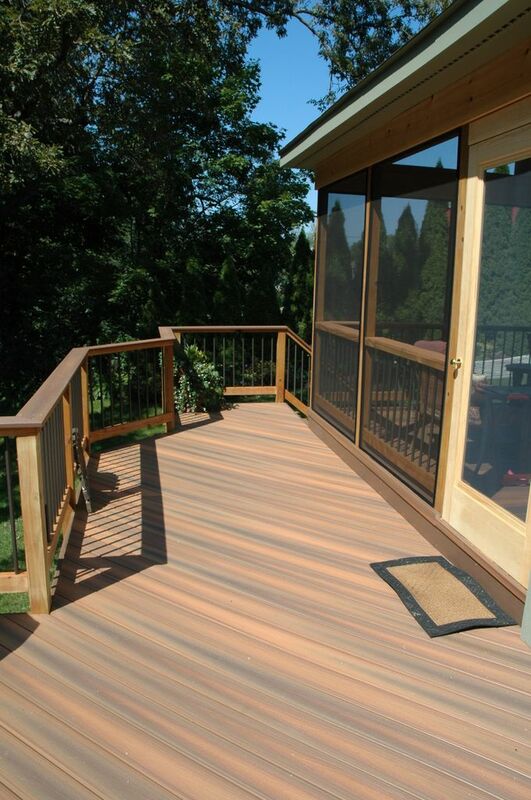 With function in mind, Archadeck of Central Connecticut is the area’s stocking dealer for SCREENEZE Porch Systems. The innovative SCREENEZE® design is stronger and more durable than ordinary screen system and helps maintain the screens integrity. We used SCREENEZE on this Wallingford, CT, screened porch for it’s versatility, ease of use and superior structural integrity. 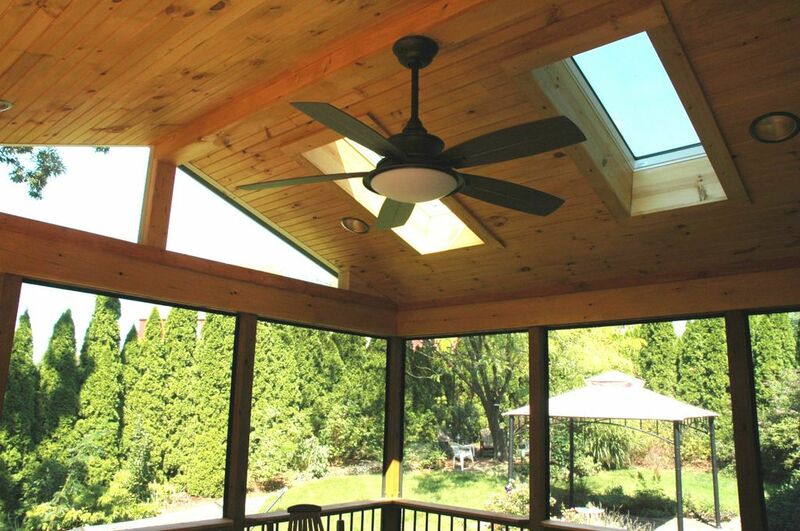 The screened porch interior boasts a stunning v-grooved pine ceiling, and two skylights on the north roof slope of the space. 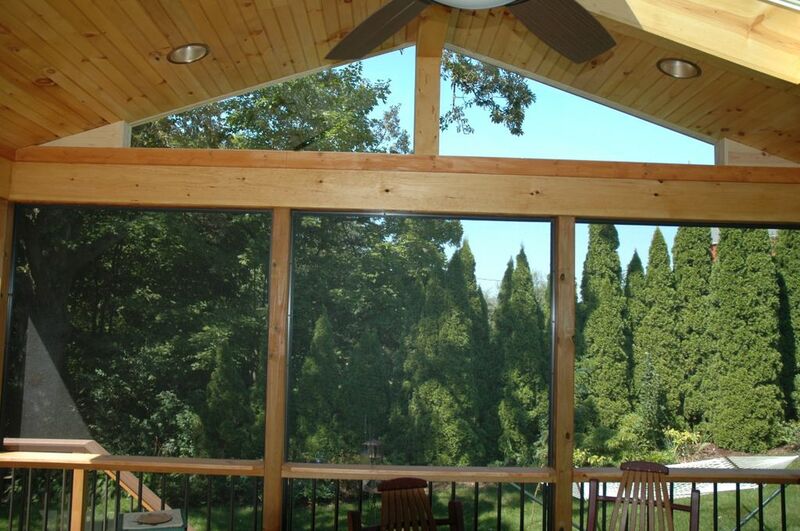 The gable end of the screened porch is glass which delivers pristine views of the lush backyard. No creature comfort was overlooked in this outdoor oasis with the addition of abundant recessed can lighting and a ceiling fan to keep the space cool on those humid days. 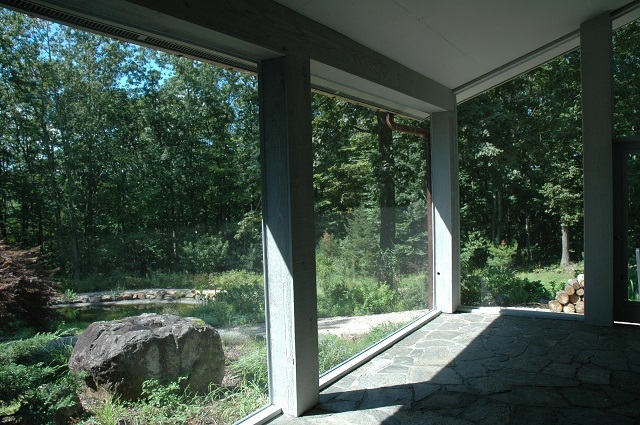 The view from this open air gallery interior in Litchfield County, CT, overlooks the lush landscaping and a serene water feature. The SCREENEZE porch screening system is a patented fixed screen system, featuring an aluminum base and a vinyl cap which are snapped together and attached to your porch or gazebo. SCREENEZE can be installed on the inside, outside, or center of your porch post and rail design. Thanks to their track system, your screened room retains its shape better than traditional screen and will not crinkle or sag over time. SCREENEZE is designed to span longer and larger distances than traditional screening methods. Up to 150 Square Feet – unlike traditional screen, this does not limit you to forty square feet or a width of 3 feet. You can do a 10′ × 15′ panel with SCREENEZE. Can be attached to any smooth uniform surface. SCREENEZE is available in white, sand and bronze. We specialize in being able to provide quality outdoor spaces for homeowners with varied budget, spatial and lifestyle needs. Each one of our screened porches is custom designed to blend seamlessly with your home and reflect your personal style. Each of our custom porches is steeped with the craftsmanship and attention to detail of a by-gone era. Think no one builds em’ like they used to? Archadeck of Central CT does! Contact us today to learn more — Call us or email us for a free consultation. (203) 793-7142 [email protected].